Turkey is a very logical destination to most Egyptian travelers. It has an easy visa, short and affordable flights, and it is not expensive. But most Egyptians stay fixated on Istanbul and forget to explore the rest of this beautiful enchanting country. Istanbul is beautiful with its blue mosque and friendly streets. But how about Pamukkale, Cappadocia, and the rest? 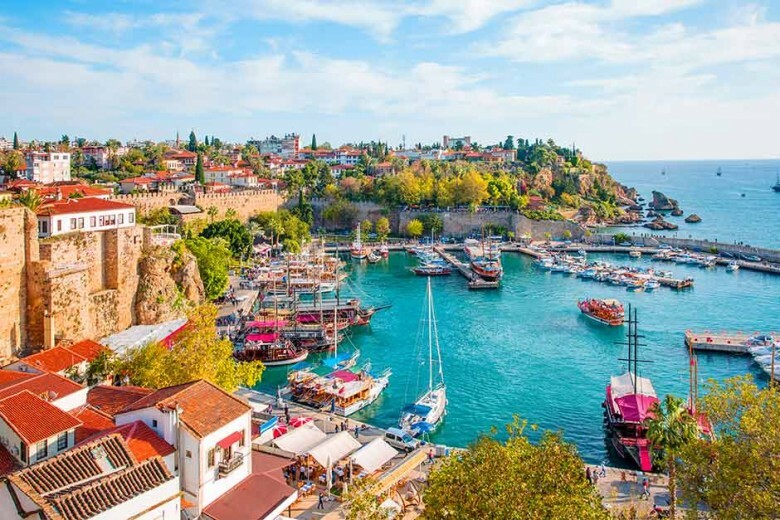 Today we will explore Antalya, the Jewel of Turkey’s south. This huge modern city has more to offer that one would assume. Antalya offers something for everyone. If you are looking for culture and history, then it is the place for you. If you are looking for beaches and relaxing, then it is the place for you. If you are looking for a night life and a loud city vibe, then this is also the place for you. The streets of Antalya are friendly, lively, and just plain beautiful. You will find tens of cafes and restaurants while walking around, and all offer delicious variety of food selections. There are other attractions such as museums, galleries, bars, and clubs as well. Walking along the coast is like a dream in itself. You will find huge mountains right across the water with waterfalls directing towards the sea. In other parts you will find dozens of yachts and boats around the harbour, many of which offer touristic tours and sunset rides. In short, at every point in the city you will find something interesting to do, or to look at. Culture is not exclusive to one thing or another. You can find a little bit of culture in every little detail in the city. In the harbour, or the antiquities. In the food, and the art scene. In the language and markets. But most of all, in the Old Quarter. 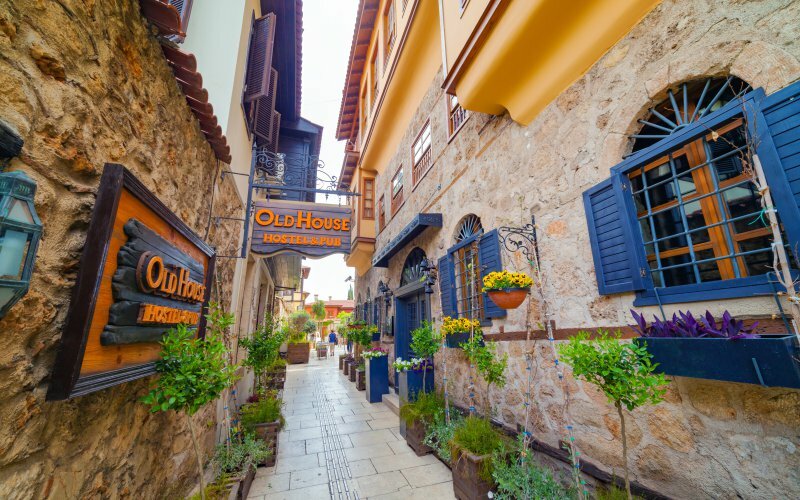 The Old Quarter is called Kaleiçi, which features Ottoman timber-framed houses sprinkled with Roman ruins. Many of its architecture has been renovated and restored. It is full of markets, restaurants and authentic boutiques. Amongst the Roman ruin highlights in the neighborhood is the Hadrian’s Gate which is a marble monument that stands in the middle of the place. Another thing you should check out is the Hammams that are very similar to the Moroccan Hammams (and honestly the ones we have here). Still, it’s an experience that shouldn’t be missed. Of course we are very well aware of this strong link between Turkey and the Greek empire that dates back to thousands of years. We have all watched Troy and other epics, and wondered how it looks currently. Well, it doesn’t look very far from Antalya. This amazing city has the right balance between modernity and ancient history. 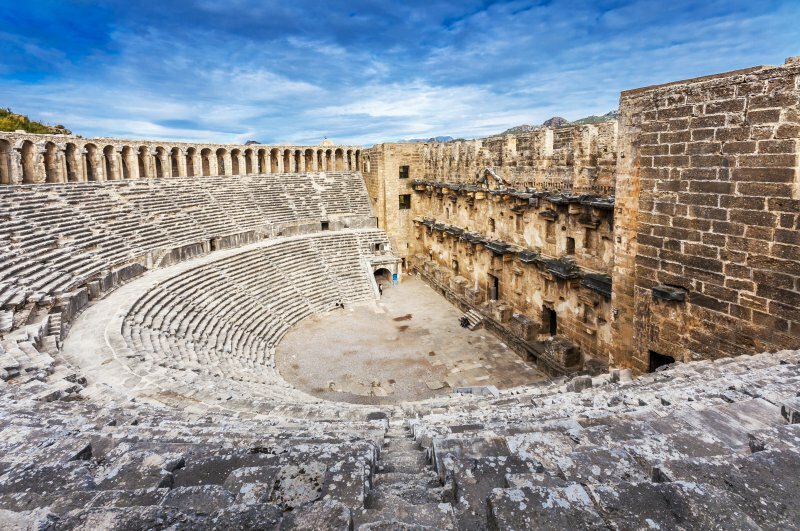 It is filled with Roman and Greek ruins that will make you forget for a while that you are not in Italy or Greece. Termessos is the most important of which. IT is a beautiful ancient Roman theatre, like the one in Alexandria, except that it’s located on top of a mountain and offers a spectacular and scenic view to its visitors. Nearby, Karain Cave offers even more antiquity – stretching back 25,000 years to be precise. Additionally, you can check Perge (Stadium), which is not exactly in the center of Antalya but it is close enough. Antalya is perfectly located and you can spend days getting to know its amazing details and scenic corners. And the beach is one of its highlight. As mentioned earlier, the harbor and other waterfronts are lively and beautiful. 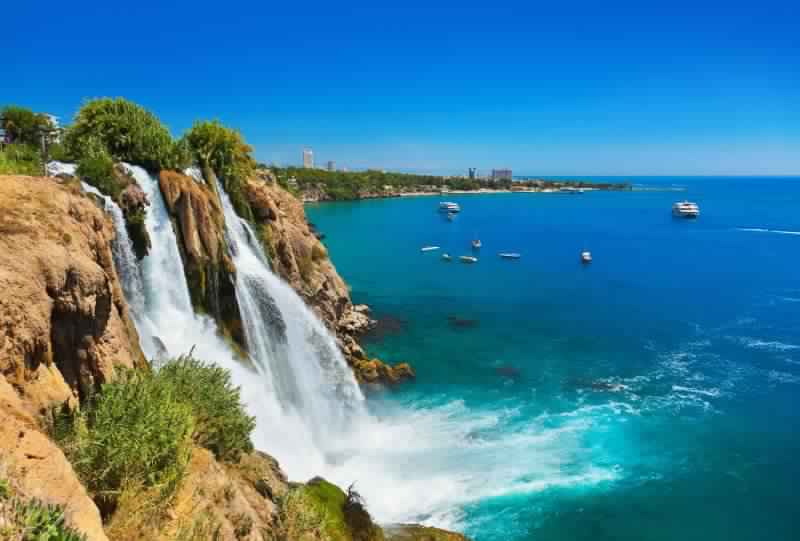 However, if you are looking for a paradise-like destination, you can also go along the coast even after Antalya. Olympos is an example of those spots. The small and equally fascinating spot was a Roman city in ancient times, then it was forgotten for centuries until it was rediscovered in the seventies of the past century. It is full of tree houses, and beaches extending across mountain lines, fires at night, and delicious food, and that is pretty much it. Just I want to say I love turkey I hope to visit in one day…..